- finally, the almost African climate of Andalusia, mild in winter and very hot in summer. Therefore, Spain is not always warm and sunny as you might think. However, if you exclude the north-facing coast, in much of Spain the summer is hot, dry and sunny. In the north, along the coast bordering the Atlantic Ocean (see La Coruna, Gijon, Santander, Bilbao), winter is mild and humid: rainfall is frequent and sunshine is relatively rare. The coasts of Galicia and Asturias, more exposed to the westerly winds, are often windy, but sometimes this can happen in Cantabria and in the Basque Country too. In Galicia (see Santiago de Compostela), the rainfall is particularly abundant, especially from October to April. In this area, summer is cool and quite rainy too, and even in July and August the sky is often covered with clouds; the sea is not warm, barely reaching 21 °C (70 °F) in August. Here are the average temperatures of Santander, in Cantabria. In this northern area, the rains are abundant, and some rain may also fall in summer. In Santander, more than 1,100 mm (43 in) of rain fall per year. Here is the average rainfall in Santander. On the north coast of the Atlantic Ocean, the sun does not shine very often, even in summer. On the coast of the Mediterranean Sea and on the small Atlantic coastline of the Gulf of Cádiz (see Barcelona, Valencia, Balearic Islands, Almeria, Málaga, Cádiz, Jerez de la Frontera), winter is mild. However, in comparison to the northern coast, the rains are rarer and the sunshine is more frequent. This is due to the fact that the Mediterranean coasts of Spain, exposed as they are to the east and the south, are relatively sheltered from Atlantic weather fronts. Along the Mediterranean coast and on the Balearic Islands, summer is hot and sunny, as is typical of the Mediterranean climate. The air is humid, but sea breezes temper the heat during the day. Here are the average temperatures of Barcelona, located in the northern part of the Mediterranean coast. The summer in Barcelona is hot and sunny, a little less hot but more humid than in Madrid, with occasional thunderstorms during the afternoon. In Barcelona, the rains are not abundant, and residents are asked not to waste water. Here is the average precipitation. While in the Costa Brava (see Lloret de Mar) and in Barcelona the average temperature in January is about 8/9 °C (46/48 °F), continuing to the south it becomes milder, and already in Valencia it exceeds 10 °C (50 °F). East of Valencia, the Balearic Islands (Mallorca, Menorca, Ibiza, Formentera) have a Mediterranean climate, but they are also quite windy. While the easternmost island, Menorca, is the windiest because of the cool wind blowing at times from southern France, Ibiza and Formentera, located more to the south, are milder and more sheltered. However, summer is hot and sunny on all the islands. To the south of the Valencian Community, where the coast is exposed to the south-east, annual rainfall drops below 400 mm (15.5 in) per year. Here are the average temperatures of Alicante, in the Costa Blanca. In the Costa Blanca, precipitation is particularly scarce. In Alicante, just 285 mm (11.2 in) of rain fall each year. Here is the average precipitation. On the central and southern coasts of the Mediterranean, the sun shines quite often even in winter. More to the south, the southern part of the Costa de Murcia and the Costa de Almería, being protected by the Sierra Nevada, are even more arid, and have a relatively dry and sunny winter, so the climate of these areas is semi-desert, and this happens also in Los Monegros, between Zaragoza and Lleida, where the movies called "spaghetti Western" were shot. On the coast of Andalusia, continuing westwards, the climate is still Mediterranean (see Málaga), but on the southern tip, where Gibraltar and Tarifa are found, it is cooler and windier in summer, and rainier in winter. In south-western Spain, we find another portion of the coast facing the Atlantic Ocean, the Costa de la Luz. But here the climate is Mediterranean, ie with hot and sunny summers, although the influence of the ocean is felt, so the heat is generally not as sultry as on the Mediterranean coast; moreover, the sea is very cool even in the middle of summer (see below). The interior of Spain (see Valladolid, León, Pamplona, Madrid, Salamanca, Zaragoza), is largely occupied by a plateau, called Meseta, which has an average altitude of 700/800 meters (2,300/2,600 feet) and has colder winters. In Madrid, the capital, located at the center of the plateau, 650 meters (2,100 ft) above sea level, in January the nighttime temperatures hover around freezing (0 °C or 32 °F), while the daytime temperatures are around 10 °C (50 °F), but sometimes during cold spells it can freeze and snow. In the plateau, the summer days are often scorching, with highs well above 30 °C (86 °F), but thanks to the altitude, nights are pretty cool, and on the other hand, moisture is low, so the heat is more bearable. In Madrid, the temperature easily reaches 35/36 °C (95/97 °F), and sometimes as high as 40 °C (104 °F). In the plateau, precipitation is not abundant (though it is quite frequent in winter) because the bulk of the moisture coming from the ocean falls as rain on the Atlantic slopes. In Madrid, precipitation amounts to 455 mm (18 in) per year. In the southern inland regions, in the lower areas of Extremadura (see Badajoz) and in the interior of Andalusia, summer is very hot: Seville and Córdoba are actually the hottest cities in Europe, and this area is like a piece of Africa in Europe. In summer, the temperatures often reach 38/40 °C (100/104 °F), and sometimes up to 45 °C (113 °F). Here are the average temperatures of Seville. In inland areas, especially in the south, in summer the sky is normally clear, and even in winter there are many sunny days. 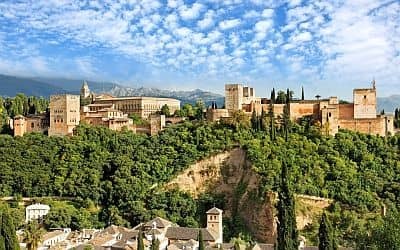 In the southern cities located at an altitude higher than the plain, such as Granada, located at 700 meters (2,300 feet) above sea level, the heat is tempered by the altitude, and nights are a bit cooler, but the days are often scorching. In the mountain regions, the climate becomes progressively more cold and snowy with increasing altitude. In addition, at the same altitude the Pyrenees in the north are certainly colder than the Sierra Nevada, but the latter is higher (Mount Mulhacen reaches nearly 3,500 meters or 11,500 ft), so, even though it is located at a southern latitude, usually it has enough snow for skiing (at high altitudes). It is possible to combine a morning's skiing with an afternoon on the coast in order to enjoy the balmy air of the nearby Costa Tropical (Motril is about an hour and a half drive away). There is also a mountainous range that crosses the Meseta, called Central System, which is divided into various chains. The one closest to the capital is the Sierra de Guadarrama, whose highest peak is Peñalara (2,428 meters or 7,966 feet), where you can ski in winter. To the south-west we find another chain, the Sierra de Gredos, at no great distance from Madrid as well. Here are the average temperatures of Puerto de Navacerrada, located at 1,858 meters (6,095 ft) above sea level. Here the landscape is green because of the higher amount of precipitation, 1,240 mm (49 in) per year, with a maximum between October and December of 160/180 mm (6.3/7.1 in) per month and a minimum in July and August of 25 mm (1 in) per month. Further to the east, in the northern parts of Navarre, Aragon and Catalonia, we find the chain of the Pyrenees. The highest peak, Pico de Aneto, 3,404 meters (11,168 feet) high, is located in Aragon. Above 2,700 meters (9,000 feet) glaciers are found. Here are the average temperatures of Abaurregaina/Abaurrea Alta, situated at 1,050 meters (3,450 ft), in northeastern Navarre. In Abaurregaina, 1,050 mm (41.5 in) of rain or snow fall per year, with a minimum in August, of 65 mm (2.6 in) and a maximum in November, of 180 mm (7 in). There are on average 126 days with rainfall and 26 days with snowfall per year; snowfall usually occurs from November to April. In the North, we also find a mountain chain parallel to the coast, the Cantabrian Mountains, whose highest peak, Torre Cerredo, 2,648 meters (8,688 ft), belongs to the group of the Picos de Europa. On the north-west coast, the sea is always very cool, if not cold, and reaches a maximum of 19 °C (66 °F) in August, as we can see from the sea temperatures at La Coruna. On the north coast (see Bilbao), the sea temperature is still very cool, even though it is a bit higher in summer. On the coast of the Mediterranean Sea (see Barcelona, Balearic Islands, Costa Blanca), the sea temperature is higher, and it is warm enough for swimming from July to September. On the Costa del Sol (see Malaga), the sea is not as warm as in the rest of the Mediterranean because of the infiltration of Atlantic waters. The sea in the small portion of the south-west overlooking the Atlantic Ocean (Costa de la Luz, see Cádiz) is even cooler. Here, the ocean temperature reaches only 21 °C (70 °F) in August and September, even though the weather is hot and sunny. For a beach holiday, as we mentioned, the Northern Atlantic coast has a cool and fairly rainy summer. Moreover, the ocean temperature is quite cool even in this period, so the Mediterranean coast is preferable, and the best months are July and August. For those wishing to visit cities and go on excursions, summer is a great season on the Atlantic side (north and north-west), where you can find cool or mild weather, very different from the rest of Spain. The same can be said with regard to the mountainous areas, which are sunny but not too hot. The rest of Spain, during summer, is hot, especially in July and August, and the heat can be difficult to bear, at least for those who don't like it. This applies especially to the Southern inland areas (see Seville, Córdoba), which are literally on fire, almost an outpost of Africa in Europe. In winter, the southern coasts on the Mediterranean Sea (Costa del Sol, Costa Blanca) are usually mild and sunny, so these areas can be pleasant even in this period (at least when compared to other parts of Europe). In general, however, the best seasons to visit the southern and central parts of Spain are spring and autumn. In Madrid and Barcelona, for example, May, June and September are the best months (though in September, especially in Barcelona, the first autumn rains occur); in Seville, which is characterized by a particularly long and hot summer, the best months are May, October and April, when the maximum temperature can already exceed 25 °C (77 °F) with some ease. For a ski holiday, snow is more likely in the Pyrenees than in the mountainous areas of the center and south. As mentioned, you can also ski north of Madrid, in the Sierra de Guadarrama, and further south in the Sierra Nevada. However, even though ski runs in the Sierra Nevada are located at very high altitudes, above 3,000 meters (10,000 ft), they are not always covered with snow, as we saw some years ago, when the World Ski Championships were postponed to the next year because of lack of snow. In winter, for Madrid and the plateau, pack warm clothes such as a sweater, a down jacket, and a raincoat or umbrella. For the Northern Atlantic coast and Barcelona, bring warm clothes like a sweater, a jacket, a raincoat or umbrella. For the south coast: spring/autumn clothes are appropriate, including a sweater, a jacket, a raincoat or umbrella. For the high mountains: mountain clothing. In the summer, for the Northern Atlantic coast, bring light clothing such T-shirts, but also a jacket, a sweatshirt or sweater and a raincoat or umbrella. 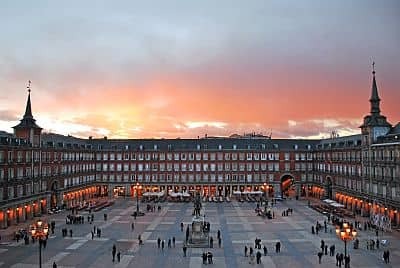 For Madrid and the plateau, you will also need light clothing as well as a sun hat, a sweatshirt for cool evenings and possibly an umbrella. For Barcelona, the Balearic Islands and the South it is wise to pack light clothes, a sun hat, and a sweatshirt for the evening in June and September (but also in July and August in the Costa de la Luz and in Tarifa). For the mountains, bring a sweatshirt, a jacket, hiking shoes, sunscreen and sunglasses. See also the climate of the Canary Islands.